Graeme Wright, a former Editor of Wisden, has produced this very illuminating analysis of county cricket in the 21st century and, as might be expected, it is very cerebral but also written in an easy, affectionate and, quite often, amusing way. On one of Bill Frindall's tour to France in the late 1990s, I, not by chance, found myself talking with Graeme and found his company and conversation fascinating even though I was aware that I was very second division in quite a few aspects of the conversation. Having enjoyed one of his previous books, Betrayal, I had no doubt that Behind the Boundary would be an equally interesting book. 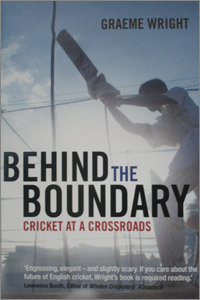 In Behind the Boundary, Graeme Wright details the changes in modern day cricket. County cricket is now much more of a business and not all the counties are thriving. Not many Chief Executives come from cricketing backgrounds or are former First-Class cricketers, the role of the coach is far different and there is more emphasis on the business need than, it may seem, the cricket. Having on occasion been to Twenty20 matches, the whole general atmosphere seems different: it seems like a business, the matches where the county draws in the money and spectators rather than a gentle game of cricket. Some of us may wilt just looking at the fixture list and seeing so many Twenty20 matches but this is perhaps inevitable given the level of debt within the county game. Graeme Wright has been in touch with the Chief Executives of the counties and put their views into this very interesting book and highlights the demands and difficulties which the counties face and how they do their best to combat them. Also mentioned, amongst other issues, are the dwindling number of county members, the change in county cricket newspaper coverage and the desire to sell tickets before the game with the difficulties associated with the fickle English weather. It all seems a far cry from a generation or two ago but shows the changing face of not just English cricket but of the climate in which we now live. But, as the book shows, there is promise and renewed hope ahead and Graeme Wright has done an exceptional job in showing what happens behind the scenes at county cricket.